I'm slowly but surely getting caught up on round robin stitching. 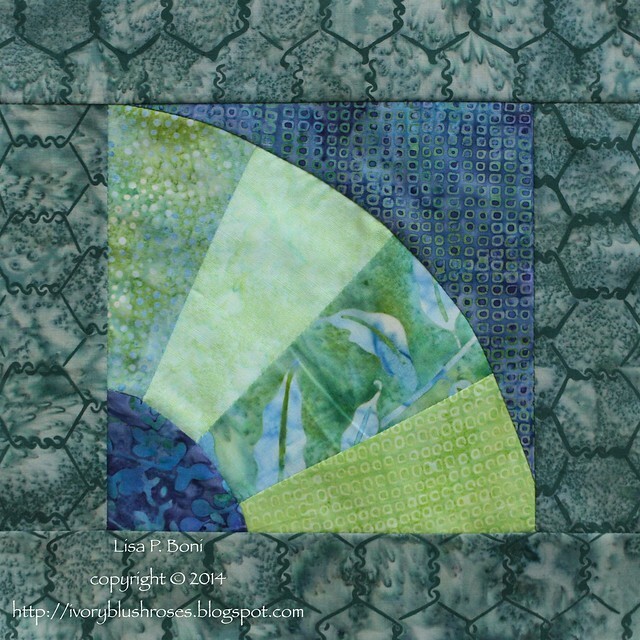 At the CQI retreat, I was able to get a good portion of the stitching done on this block, which definitely helped! 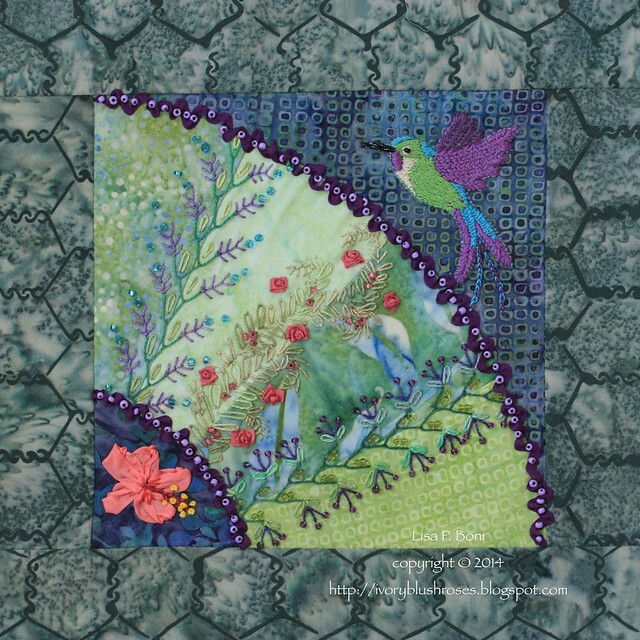 I loved the green and blue fabrics that Thearica chose, especially that "chicken wire" fabric around the edge! Thearica asked for a tropical/jungle theme with bright colors. 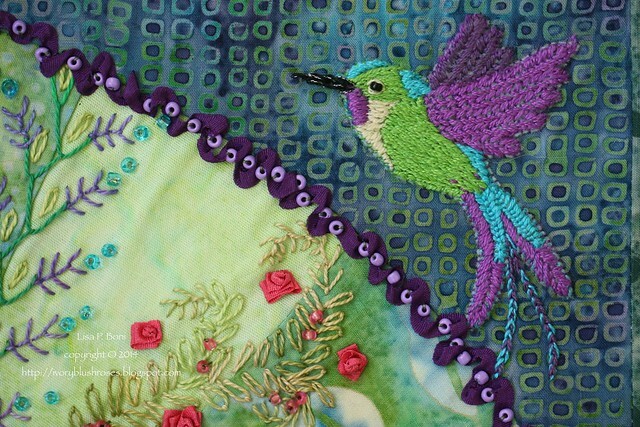 The other participants had already stitched things such as a parrot, a tree frog and a lovely spider web, so I opted to do a tropical hummingbird. All the completed fans also had a ruched silk ribbon trim around the outer edge of the fan, so I followed suit and added some purple silk ribbon with beads. 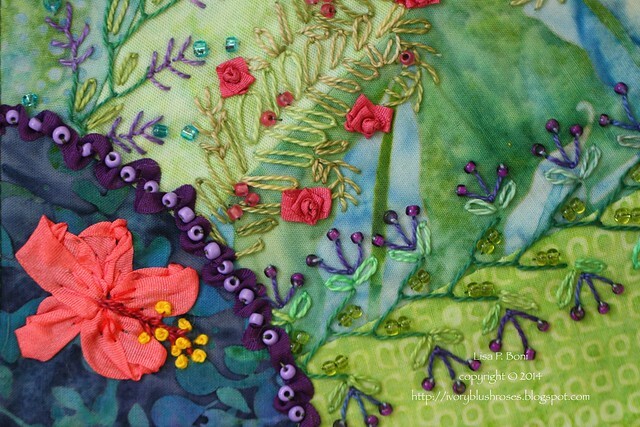 In the corner, I stitched a Hibiscus flower in silk ribbon. This was definitely a fun block to work on and I can't wait to see how Thearica puts the blocks together! 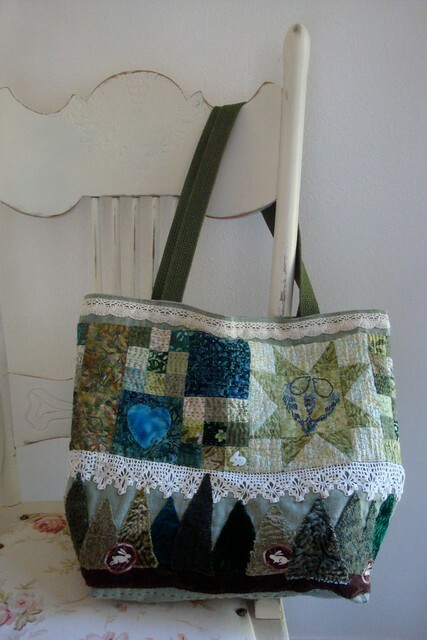 Remember this purse that I made back in 2010? 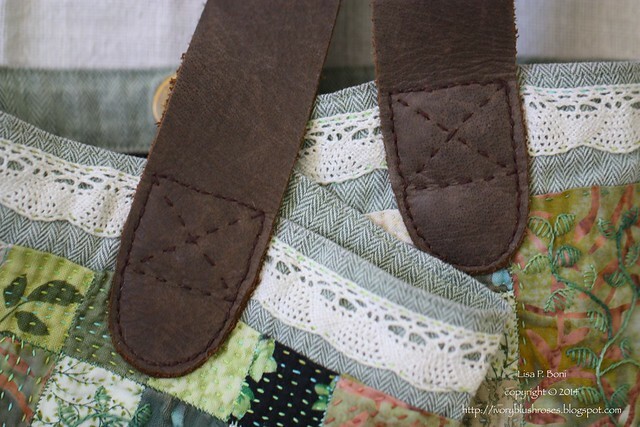 I have used it so much that the woven canvas handles wore completely through. Before I went to the CQI retreat, I wanted to replace the handles with a rolled leather handle - which turned out to be difficult to find. Most rolled handles were microfiber or faux leather and not at all to my liking. The few leather ones I did find were too short to fit comfortably over my shoulder. So I thought I'd make my own and purchased some nice soft chocolate brown leather, intending to sew two straps on the sewing machine. But my newish Husquavarna-Viking machine would NOT sew through the leather, no matter what I tried. Then I found some nice plain leather straps at JoAnne Fabrics and decided that plain straps would work fine for the time being. This leather was thicker through and I also had to purchase a tool to punch appropriate sewing holes so that I could attach them. I waxed some dark brown upholstery thread and sewed the straps on by hand. 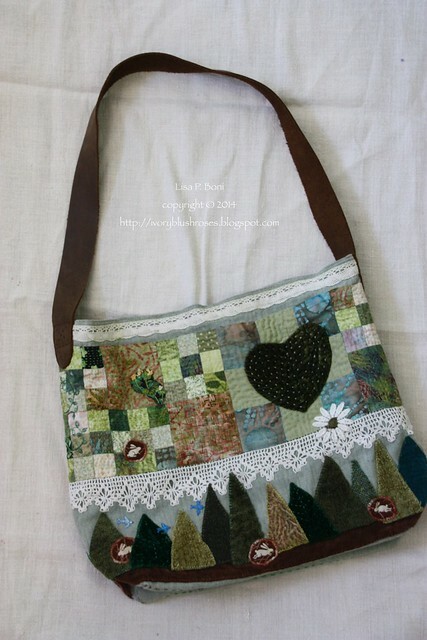 It came out well, though I ended up just doing one strap, rather than the two that the purse had before. It's so nice to be able to use my favorite purse once again! Just before I left for the retreat, the majority of my fan blocks returned home! These were stitched by Thearica B, Gerry K, and Connie K. There is still one block to return home and then I intend to finish four more myself to make a wall hanging. I also received my Under The Sea block back right about the time of my daughter's wedding and have just realized that I never posted a pic of it! 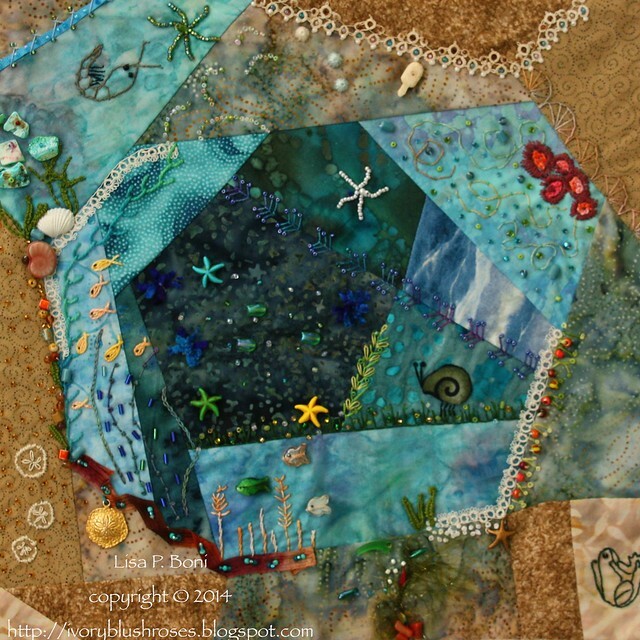 I asked for the participants to think Tidal Pool and to have all the elements circle the block so that the center is the focal point. The stitchers on this block were Shelly R, Ola M, Linda P, and Velia A. I'll add a bit more to this before I'll call it finished. I'm thinking that I'll use this block to make a new tote bag! We have finally received back the photos from my daughter's wedding, and I look forward to sharing some of them in the near future as well as doing a post about the CQI retreat next! I am curious if you folded under the ends of the purple ribbon ruching or are they sewed in the bfabric seam? This is a beautiful block. What great eye candy!! 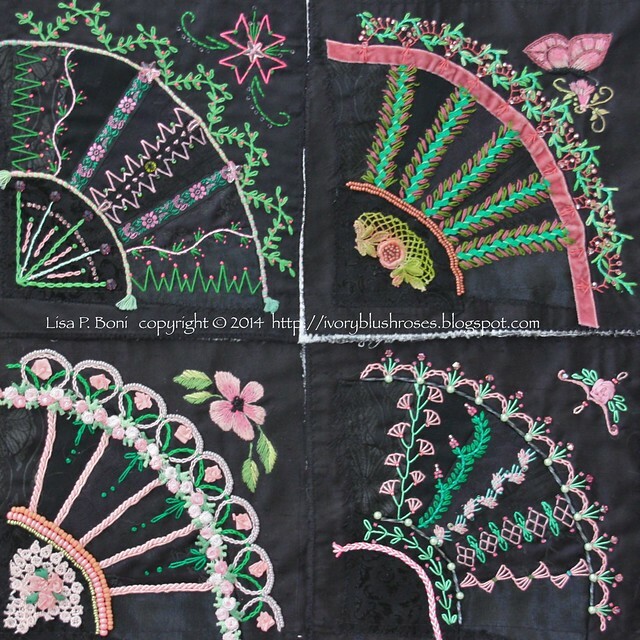 I love those black fan blocks; there are some fantastic seam treatments there! It was fun having you at the retreat and I look forward to seeing the pictures. And of course, we are ALL waiting to see Jessie's wedding pictures!! Such beautiful images today. Lots to drool over!